If you’re looking to make a purchase on eBay Canada or USA, here’s your chance to save 20% off everything, up to $100 in savings. The online auction site says all you need do is use coupon code PSPRING20 at checkout, to save 20% off, as long as you pay for your item by 8PM PST/11PM EST today, on March 9, 2018. The discount applies to the purchase price before shipping, handling and taxes, on items $25 or more, with savings capped at $100. Exclusions: Coins & Paper Money, Gift Cards & Coupons, and Real Estate categories. There are some official retailers that run stores on eBay, so this 20% off coupon is not too shabby, if you’re looking for a big ticket item up to $500 CAD, which could be a used iPhone or iPad, or any other Apple product (even HomePod!). 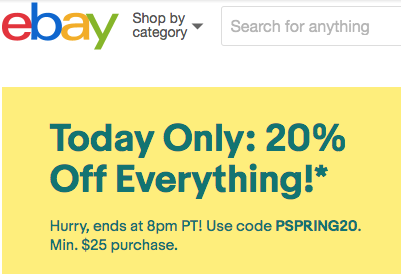 Click here to visit ebay.ca to get started and don’t forget to use coupon code PSPRING20.